The widower, Gid Tilman, has a strange reputation, both in Banthe and in Newbury Acres. He rules his three children, Freddie, Henry, and Ellie, dangling their futures over their heads and demanding their loyalty to the family business. Freddie will take over the large woodworking business while Henry will get the farm. And Ellie may only marry someone who is acceptable by Gid—and chances are that man doesn’t exist! 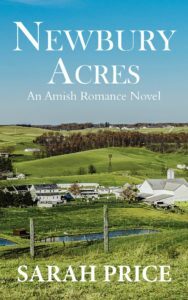 Despite being considered an upstanding member of the Amish community in Newbury Acres, he has an odd habit for purchasing land from his neighbors. Whenever a farmer is in financial trouble, Gid is right there to buy the farm and lease it right back to the farmer. While many people whisper about how Gid seems determined to buy up all the land in Newbury Acres, no one can complain out loud (or to the bishop!) because he’s also helping the different families in the community. In fact, most families in Newbury Acres have some tie to the Tillman family. If Gid hasn’t purchased their land, he certainly is waiting for that moment to acquire it should the opportunity arise. And many of the young men work in the Tillman woodworking store which sells furniture all across the country. But the one question that lingers on everyone’s minds is why not one of Gid’s children have married yet. Does it have anything to do with Gid’s curious marriage? Or perhaps his strict standards of who is worthy to carry the Tilman family name. Find out more on March 21, 2017 when Newbury Acres is released!